LONDON: 28 Margaret Street, Oxford Circus, W.
MILWAUKEE, U. S. A.: THE YOUNG CHURCHMAN CO.
Percy Dearmer (1867 - 1936) was a Christian socialist and probably best-known as the author of A Parson's Handbook, a popular guide to the ritual and conduct of Anglican liturgies. He was also chief editor of The English Hymnal, one of the major hymnals of the Church of England. 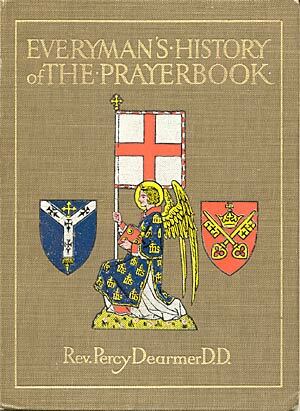 In this 250-page book he gives an accessible account of the history and content of the Book of Common Prayer, as it existed in 1912 when the book was written. One can see from this book that the author was deeply appreciative of the tradition and sources of the Book of Common Prayer, but in no way blind to its shortcomings, as he perceived them. He has strong opinions of the way development of the Book of Common Prayer should take (or should have taken), but, in most cases his opinions were vindicated by subsequent events. 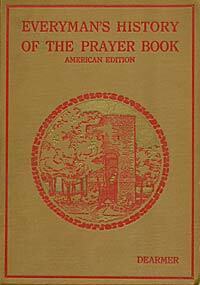 An "American Edition" was also published, which differed primarily in the inclusion of an additional chapter on the American Prayer Book. We include this chapter (and the other changes and additions) here without changing or renumbering subsequent chapters, resulting in two Chapter 12's. The entire book is presented here, along with the copious illustrations. Note that some of the chapters are fairly long and so may take a while to download. to the Lutheran and other Reformers, who won for us some part of our Christian freedom. "Excellent courage our fathers bore." Only to those on each side he would plead that, if anything in these pages displeases them, they should remember the other side. Everyman's History of the Prayer Book is written for Everyman; and, after all, the Master whom we are each trying to follow is above all our divisions, rebuking our uncharities, and blessing every step we take along that Gospel way which is narrow to us only because we come so far short of God's infinite breadth. Everyman's History of the Prayer Book is for Everyman, endeavouring to present that amount of matter which Everyman ought to know something about. The author has already written a very small introduction to the subject, called The Prayer Book, What it is, and he has avoided repeating from that little work more than seemed necessary, so that it may be taken, with one or two pamphlets, as a manner of appendix, completing what he has tried to say. Here are some of the more recent books on the subject:— F. Procter and W. H. Frere, New History of the Book of Common Prayer (Macmillan, 12s. 6d. ); L. Pullan, The History of the Book of Common Prayer (Longmans, 1s. ); B. Reynolds, Handbook to the Book of Common Prayer (Rivingtons, 4s. 6d. ); P. Jackson, The Prayer Book explained (Cambridge University Press, 2 Parts, 2s. 6d. each); A. W. Robinson, The Church Catechism Explained (Cambridge, 2s. 6d. ); H. O. Wakeman, Short History of the Church of England (Rivingtons, 7s. 6d. ); and a little manual by Dr. Moule, Bishop of Durham, The Story of the Prayer Book (Longmans). The First and Second Prayer Books have been recently published again as a volume in "Everyman's Library" (Dent, 1s.). For further liturgical study the reader is recommended to go first to the works of Bishop Dowden, Brightman, Duchesne, and Frere, and to the publications of the Alcuin Club and the Henry Bradshaw Society. To her Majesty Queen Alexandra the writer offers humble and loyal thanks for the permission so graciously given to print a reproduction of Professor Tuxen's picture of a beautiful incident in her Majesty's Coronation. The writer owes much gratitude to the friends who have helped him in his work, especially to Mr. F. C. Eeles, Dr. Frere, and Mr. Brightman. He is also much indebted to those who have helped in providing pictures, to whom acknowledgements are given in the List of Illustrations. The American editor has introduced into the work only such changes as are necessary in order to adapt it to use in the American Church and according to the American Book of Common Prayer.